Every time I use something from Physicians Formula, I wonder why I never tried it before. It is amazing to discover products that perform so well, they rival the most expensive beauty products I have ever used. I love a good foundation and that is usually where I feel the need to splurge the most, until its not! 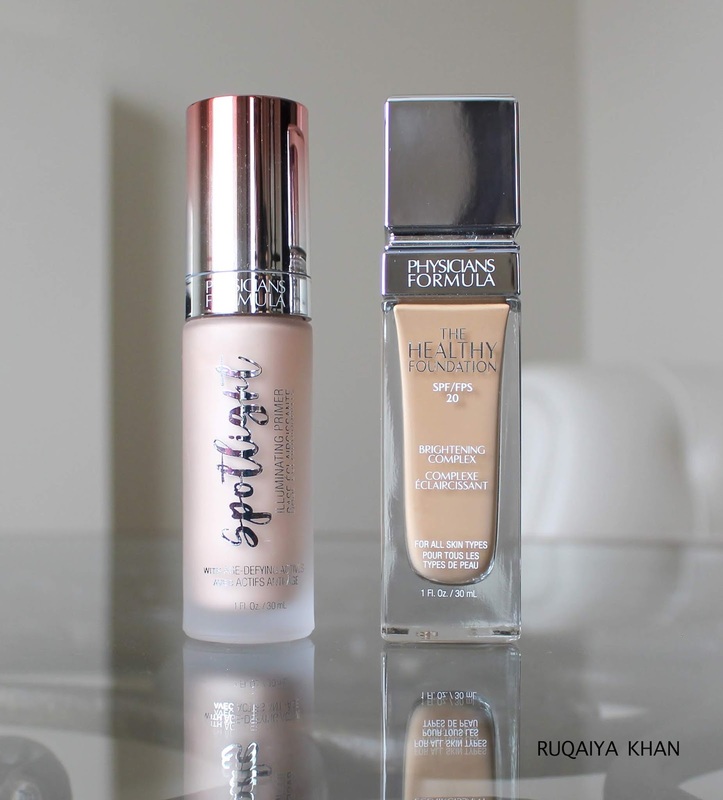 The Healthy Foundation with SPF 20 from Physicians Formula is a fantastic addition to my routine and even though this foundation stays perfectly without a primer, the new Spotlight Illuminating Primer adds just enough luminosity to skin to appear dewy and fresh. As I get older and the contours of my face deepen a little more, I have actually started to appreciate highlighting products in a new light. I never thought I would be so concerned about how my eye area appears but as time goes by, I realize that these products takes years off my face just by bringing in more light or should I say Spotlight! More on these amazing products from Physicians Formula at London Drugs in today's blog. This foundation from Physicians Formula is described as a lightweight, medium coverage foundation with a healthy satin finish. This foundation comes with SPF 20 and is formulated with 'brightening complex' and hyaluronic acid to brighten and improve the appearance of skintone. I have been using this for a month and I absolutely love it. I did not notice this clinging to any dry patches nor does it make my skin oily. It gives a natural looking satin-matte finish on me. During this time of the year my skin tends to look dehydrated more often and even though I would love to drink as much water, however, my face shows signs of dehydration the most. I love that this foundation makes my skin look fresh. The shade that I am using is MN4 which is a medium-neutral shade and just a touch dark for me especially, since it oxidises slightly after application. However, its still a pretty good shade for me. I usually apply this foundation using a foundation brush and sometimes with a buffing brush and it always looks good. Its covers pretty much all imperfections and I usually do not need a concealer on top for this one. I feel that the coverage is buildable as I can achieve a medium-full coverage by layering it on, but it never looks cakey on me. I love the packaging as well. It's a tall, glass bottle with a sponge tip applicator which I am really enjoying. I love using concealers with a doe foot applicator and having a giant one for foundation just makes the whole process a lot more convenient. I no long have to pump out or drop the foundation on my fist. I simply dot this foundation all over my face and buff it out. Then I do a second coat in areas that need more coverage. I found this to work nicely even on my under eye area, so I am definitely using this foundation as a concealer as well. I set this foundation with a setting powder, especially under my eyes and around my nose. I do that no matter which foundation I use, however, even on days when I did not use a setting powder, it seemed to look just fine. I am quite happy with how easy it is to use and how nicely it blends and stays on skin. This primer is just what I needed this season. It's a little shimmery and might look a little too much right under the sun, however, it looks fantastic on skin. If you are on a highlighter craze, then this primer will not disappoint. It adds enough radiance to blur out all the imperfections and allows my skin to catch light in all the right areas. This year, I started to feel that the hollows of my eyes are deepening and so is the cheek area, where I usually would apply a contour powder but when it happens naturally and without my wishes, I feel infuriated-more like violated! Like why am I aging and I can't imagine that the age is actually ticking in. Because I still feel young! :( I know every one goes through those emotions at some point but I am glad that there are beauty products like this one that makes us feel happier, prettier and look amazing! The Spotlight primer is designed to blur and correct imperfections for a radiant spotlight glow. It is enriched with age defying actives and vitamin A & E antioxidant blend to protect against environmental aggressors and optical blurring agents - seriously thats all I need as I age! 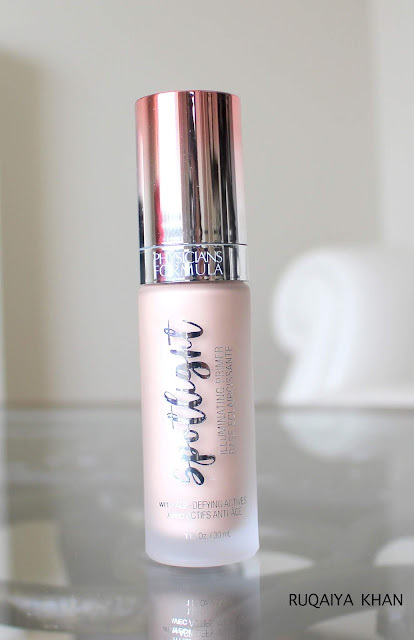 I like to use this primer under my foundation and it just adds a little bit of shine and dewiness to my look but if I am looking for the ultimate spotlight experience, I mix this primer with my foundation and then apply and it looks amazing, especially in photos! It can also be applied on top of my foundation only to the high points on my face and I like how it works as a liquid highlighter. Overall, I feel that this is one heck of primer and is so versatile and affordable, that everyone needs to get this asap! Physicians Formula The Healthy Foundation and Spotlight Illuminating Primer are available at London Drugs for $19.99. These cruelty free, paraben free products are great for sensitive skin and they work so beautifully that I would prefer them over my more expensive foundations and primers. I would highly recommend you try these. Click here to find out my favorite Physicians Formula products.